Supergirl followed up its crossover musical magic on The Flash with an episode directed by comic book nerd and acquired cinematic taste, Kevin Smith. While no stranger to the CW superhero universe (he directed one of the better episodes of Supergirl this season), this turn in the director’s chair featured fewer Smith fingerprints than previous outings. Sure, there were the meta references (the yoga studio Maggie and Alex walk out of is a play on Smith’s Yoga Hosers movie) and the actors performed a little looser than normal, but the episode just didn’t have the snap that other episodes he directed had. Smith was handed no easy task. He did have the job of both following up the musical (which, given Melissa Benoist’s contributions, made it as much of a Supergirl episode as a Flash outing) and rounding up stray plot threads, and guiding them toward the season’s endgame – a far cry from the one-off adventure he helmed earlier this year. The hour would have fit thematically as a Thanksgiving episode, as Mon-El faced a choice of siding with the family he was born into versus the family he’s created. Mon-El’s mother, Queen Rhea (played with zeal by Teri Hatcher) makes the choice more difficult by putting a price on Kara’s head that no bounty hunter in the galaxy can deny. The bounty frontloads the action, and affords Hatcher the opportunity to channel her inner Maleficent. The highlight of the episode was the fight between Kara and a mind-controlled Mon-El that was only decided after Winn came up with an inventive use for a stapler. The queen will stop at nothing to get her way and unite her family, including lying to her husband about posting the bounty ,and packing Kryptonite daggers to a meeting with Kara and Mon-El, or just killing Kara, herself. With Kara wounded, Mon-El is left with no choice but to return to Daxum with his mother, if it means saving Kara’s life. Over in B-plot land, Alex and Maggie are having one of their relationship moments. A chance encounter with an old flame of Maggie’s reveals that Maggie is kind of a broken mess of a person. Alex learns that Maggie’s old relationship failed because she cheated, and then covered up the fact to Alex. Give Alex credit; they actually made it through this rough patch without breaking up, so that progress … I guess? Kara is beside herself and pleads with the team to mount a rescue operation that would defy the direct orders of President Lynda Carter (who remember, is herself, an evil alien imposter). The team finds a way to board the ship using the portal introduced in the last episode Smith directed. Following a clever Martian Manhunter switcheroo, Mon-El steps up, makes the heroic play and tells his parents he’s not going with them, and never returning to Daxum. Mon-El’s father (Kevin Sorbo) sees the determination in his son and is not impressed by the underhandedness of his wife, and lets them go. 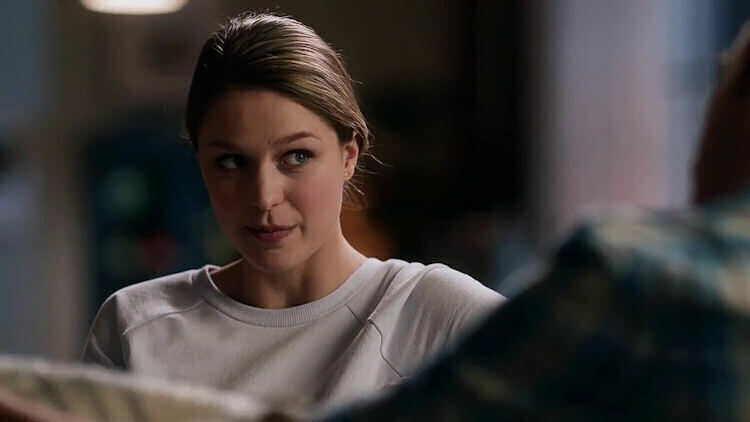 So, while Kara and Mon-El share snuggles on the sofa, the rest of the season is taking shape, now that the DEO is in the president’s doghouse, and the queen killed her king and swears revenge on Earth (but keeping hope of a reunion with Dean Cain alive so … yeah!). For a transitional episode, this was just all right. There was enough Kara charm and earnestness to feel like a Supergirl episode, but a missed opportunity at the same time. It seems like a waste to bring in a director so steeped in comic lore as Smith is, to make an average episode a little better, rather than using him in more of that one-off capacity, where he can really make his mark on the series.